Lebap velayat is situated on both side of the Amu Darya River; having the Kara Kum desert on the left and the Karabil hills in the north. The Sundukli sands are located in the centre with the massif of Kugitang in the southeast. The area of the velayat equals 94 000 km2. The capital is Turkmenabat, other industrial towns are Atamurat, Magdanly and Seydi. The climate of Lebap is sharply continental, droughty hot summer and moderately cod winter. Major part of the velayat's territory is occupied by desert areas with poor vegetation. The main industrial are gas, food, textile and chemical branches-ammonium and carbomide works, a modernized gin in Turkmenabat. Animal husbandry and agriculture are also well-developed branches of the region. Lebap velayat has good prospects regarding industrial and transport development. Tourist itineraries around the region include a trip to the reserved places of Kugitang - magnificent mountains with luxurious primeval nature and abundance of rare species of animals and plants. One can see here not hot only a sparking “Lunar landscape” and “Plateau of Dinosaurs” with paw prints of the pre-historic reptiles, but also contemplate wonderful pictures of the the karst caves created by the nature's fantasy. The other worldwide know reserve is Repetek Biosphere Reserve that has many endemic species of representatives of flora and fauna. 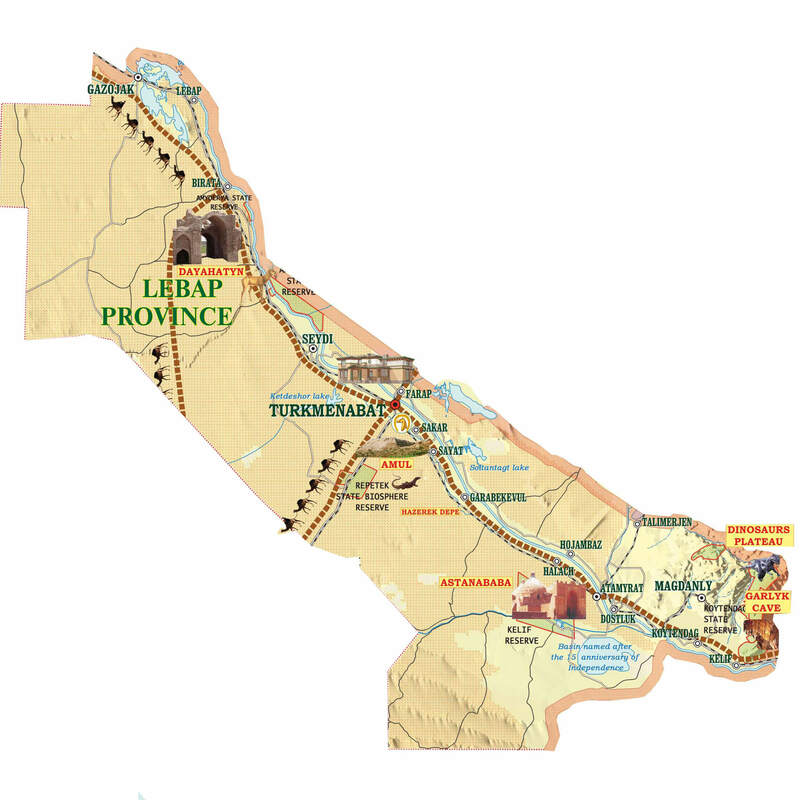 Beside, Lebap land many also keeps many other secrets you can get in touch with just by visiting the city-museum of Atamurat with its ancient caravanserais, mausoleums of Alamberdar and Astana-Baba, which continue to be the of pilgrimage for many believers up to now.